The NOOK tablet can do a lot of neat things, but eventually, you’ll want to read something on it — books, magazines, newspapers, even comic books. Good news! That’s just about as easy as tapping your finger. But wait, there’s more: You can also make notes about what you’re reading. You can highlight favorite passages. You can place multiple bookmarks within the book. And you can share your literary criticism or recommendations with friends using websites like Facebook. Tap any icon that looks like a document (the Home screen, the Library, or file folders) to open the file and let it fill the screen. 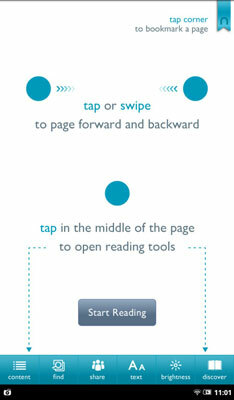 Tap or swipe to turn pages. The books you read most recently are in the I’m Reading section, but even if they’re off that list and back to your Library, you can return to the exact page you last read when you reopen a book. Once you have purchased a book, you probably want to begin reading it. Go to the Home screen and tap any cover on any of the top three panels. Not all books are displayed here, though — just the ones you put on this version of the desktop. Go to the Keep Reading section (on the lower third of the Home screen) to reopen a something you were previously reading. Go to the Library to open the folder (and there you can find books you have purchased or obtained from the Barnes & Noble website, from other online sources, or those that have been brought over to the device from a personal computer or laptop). To turn to the next page, tap anywhere along the right edge of the page. To turn to the next page, swipe to the left; think of this as flicking a page from the right side of an opened book to flip it over. To go forward one page, place your finger on the right side of the page and keep it in contact as you slide it to the left. To turn back to the previous page, tap anywhere along the left edge of the page. Swipe to the right to go to previous pages. To swipe right, place your finger on the left side of the page and slide it to the right (flicking a page, in an electronic way). You may see a page number on the screen that corresponds to the printed version of the book (and it could be the hardcover or the paperback). In any case, because the type may be larger than what’s in the printed edition, and the screen is smaller than the paper, a single page on your NOOK Tablet may spread across several screens or digital pages. In some designs, you may “turn” page 47 three times before it moves to page 48. Here’s the trick to comparing notes between two eReaders, or between an electronic and a printed copy: Ask for the wording of a particular passage and then find that same passage on your NOOK Tablet by using the Search (also called Find) function.